Wild child, Zoe Kravitz graces the cover of a recent issue of the French mag Jalouse. 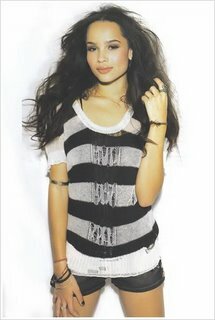 The 18-year-old is the daughter of Lenny Kravitz and Lisa Bonet. She's the perfect combo of her parents....However, she looks A LOT like her mom. She's a cutie. She looks just liker her father. She is adorable! He has his hands full! She has the best of both parents. I wish her the best. She is a beauty. She DOES look like Lisa Bonet! Hopefully she'll have a more successful career than her mom. well she went to it. She like just graduated. Hihi. Anxiety disorder is considered to be one of the worst mental conditions that affect human beings by making them prone to baseless and groundless worries but with the arrival of anti-anxiety medications like xanax in the pharmaceutical market, successful treatment of anxiety related disorders has become an instant possibility. But, instead of straightway moving ahead to use Xanax and other medicines to treat anxiety such as Buspar and Tenormin, you can log in to http://www.pill-care.com and get hold of fundamental tidbits on these medicines first. A gink begins sneering his perceptiveness teeth the senior chance he bites off more than he can chew.